1.Quick pick me-up – Cucumbers are a good source of B vitamins. Put down your sodas and coffee and eat a cucumber slice. 2. Rehydrates body and replenishes daily vitamins – Cucumbers are 95 percent water, keeping the body hydrated while helping the body eliminate toxins. Cucumbers have most of the vitamins the body needs in a single day. Don’t forget to leave the skin on because the skin contains a good amount of vitamin C, about 10 percent of the daily-recommended allowance. 3. Skin and hair care – If you don’t like to eat the skin, it can be used for skin irritations and sunburns as aloe would be used. Place a slice over puffy eyes and its anti-inflammatory properties help reduce puffiness. The silicon and sulfur in cucumbers help to stimulate hair growth. 4. Fight cancers – Cucumber are known to contain lariciresinol, pinoresinol, and secoisolariciresinol. These three lignans have a strong history of research in connection with reduced risk of several cancer types, including breast cancer, ovarian cancer, uterine cancer and prostate cancer. 5. Home care – Eliminates a foggy mirror. Before taking a shower, rub a cucumber slice along a mirror and it will eliminate the mirror fogging up. Instead of WD40, take a cucumber slice and rub it along a squeaky hinge and your door will stop squeaking. 6. Relieves bad breath – Take a slice of cucumber and press it to the roof of your mouth with your tongue for 30 seconds, the phytochemcials will kill the bacteria in your mouth responsible for causing bad breath. 7. 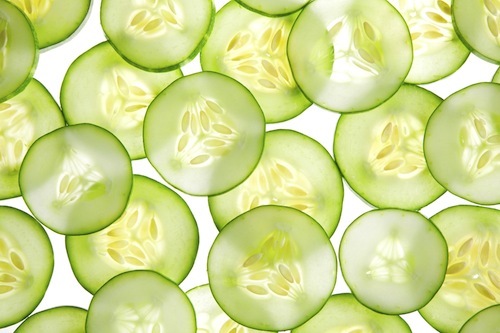 Hangover cure – To avoid a morning hangover or headache; eat a few cucumber slices before going to bed. Cucumbers contain enough sugar, B vitamins and electrolytes to replenish many essential nutrients, reducing the intensity of both hangover and headache. 8. Aids in weight loss and digestion – Due to its low calorie and high water content, cucumber is an ideal diet for people who are looking for weight loss. The high water content and dietary fiber in cucumbers are very effective in ridding the body of toxins from the digestive system, aiding digestion. 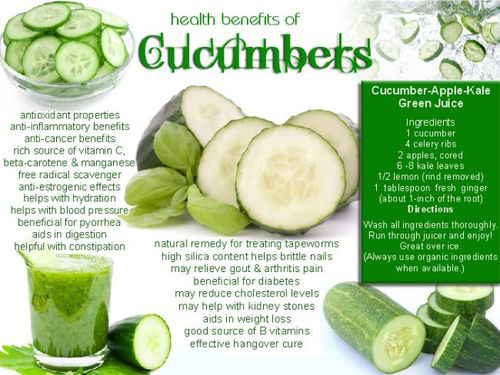 Daily consumption of cucumbers can be regarded as a remedy for chronic constipation. 9. Cures diabetes, reduces cholesterol and controls blood pressure –Cucumber juice contains a hormone which is needed by the cells of the pancreas for producing insulin which has been found to be beneficial to diabetic patients. Researchers found that a compound called sterols in cucumbers may help reduce cholesterol levels. Cucumbers contain a lot of potassium, magnesium and fiber. These work effectively for regulating blood pressure. This makes cucumbers good for treating both low blood pressure and high blood pressure. You’ve made some good points there. I checked on the web for additional information about the issue and found most people will go along with your views on this site.